This entry was posted in Truth2Freedom Headline Alerts on February 18, 2017 by Truth2Freedom. As the great hymn of praise reaches a crescendo, every created thing which is in heaven and on the earth and under the earth and on the sea, and all things in them joins in. This all-inclusive statement is reminiscent of ﻿Psalm 69:34﻿: “﻿Let heaven and earth praise Him, the seas and everything that moves in them,﻿” and the concluding verse of the Psalms, “﻿Let everything that has breath praise the Lord. Praise the Lord!﻿” (﻿Ps. 150:6﻿). 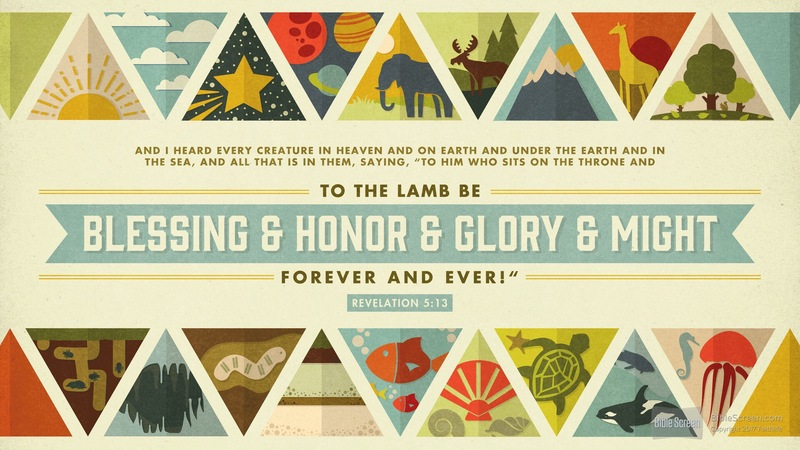 This mighty chorus cries out, “﻿To Him who sits on the throne, and to the Lamb, be blessing and honor and glory and dominion forever and ever.﻿” Endless blessing, endless honor, endless praise,endless glory, and endless worship belong to God the Father and the Lord Jesus Christ. The creation is unable to contain its joy over its imminent redemption (cf. ﻿Rom. 8:19–22﻿). This entry was posted in Daily Devotional Guide, Verse of the day on February 18, 2017 by Truth2Freedom. Today’s verse refers to the walk of becoming more like Christ. It takes place when we live by faith. When we judge everything by what we see, however, we will have difficulty growing. Remember the twelve spies Israel sent into Canaan (Num. 13)? Ten came back and said they felt like grasshoppers in a land of giants. Those ten walked by sight. But Joshua and Caleb had faith, knowing that God was on their side. Ten didn’t think God could handle the circumstances, but two knew He is bigger than any situation. Do you live by faith? If you want to grow spiritually, believe God’s Word and trust Him in every situation. God’s love is vicarious and sacrificial. Today we continue a short study of a topic that brings joy to every Christian: God’s love. Both Paul and John call His love “great” (Eph. 2:4; 1 John 3:1), because only great love would provide such a sacrifice as God did in Christ. We have already seen that God’s love is unconditional, unrequited, and righteous. God’s love is also vicarious; it bears the pain of others. In a prophecy about Christ, Isaiah wrote: “Surely our griefs He Himself bore, and our sorrows He carried” (53:4). Christ bears our earthly sorrows, and, infinitely more significant, He bore the pain and punishment for our sins. True love is a sacrificial love that gives without expecting anything in return. God gives so many good things to everyone, and He gave the greatest gift of all, His Son. As John 3:16 teaches, love was His motive for sending Christ to die; He wanted to provide salvation for us. Again we must examine ourselves after seeing God’s love. Galatians 6:2 says, “Bear one another’s burdens, and thus fulfill the law of Christ.” Are you encouraging and helping other Christians in difficulty? Also, ask yourself if you love regardless of the sacrifice. Some will “love” up to the point of pain or inconvenience but no further. However, Jesus commands us, “Love your enemies, and do good, and lend, expecting nothing in return; and your reward will be great, and you will be sons of the Most High; for He Himself is kind to ungrateful and evil men” (Luke 6:35). Love is not always easy, but it’s always best. So much more could be said about God’s love. Countless books and hymns have been written about it. We can get only a basic understanding in these few paragraphs. But let this introduction serve as a starting point for a lifelong study of God’s love. It’s one of the greatest themes in the Bible; you can’t miss it. Suggestions for Prayer: Pray for strength to bear the burdens of others and to love with sacrificial love. For Further Study: Jesus talks about His love for us in John 15:9–17. In what ways should we respond to God’s love? ✧ Based on these verses, think of specific ways you can demonstrate your love for God and others. Now here is a strange thing. If you talk about mysticism in our day, every fundamentalist throws his hands high in the air with disgust to let you know that he considers the mystics dreamers, those who believe in the emotion and feeling. But all of those old saints and the fathers of whom I have read taught that you must believe God by a naked, cold intent of your will and then the other things follow along. A naked intent unto God—those old saints were practical men. They have exhorted us to press on in faith whether we feel like it or not. They have exhorted us to pray—when we feel like it and when we don’t. They never taught that we would always be lifted emotionally to the heights. They knew that there are times when your spiritual progress must be by a naked intent unto God. The positive result for those who mourn is very clear: “they shall be comforted.” God reserves the blessing of His comfort exclusively for the contrite of heart. Those of us who mourn over sin will have our tears wiped away by Jesus’ loving hand. The Old Testament similarly speaks of God’s comfort for the true spiritual mourners. Isaiah said that Messiah would come “to comfort all who mourn, to grant those who mourn in Zion, giving them a garland instead of ashes, the oil of gladness instead of mourning” (Isa. 61:2–3; cf. Ps. 23:4). In one sense, this “comfort” will be realized only when we meet our Messiah face-to-face. In heaven the Lord “will wipe away every tear from [our] eyes; and there will no longer be any death; there will no longer be any mourning, or crying, or pain” (Rev. 21:4). Even the most discontented Christian is assured that eternal comfort awaits God’s children in glory. But God is also the God of present comfort. As we continually mourn over sin, He will continually comfort us. The Scripture declares that “God our Father” has already “given us eternal comfort and good hope by grace” (2 Thess. 2:16; cf. Rom. 15:4; 2 Cor. 1:3). May we walk, therefore, in the light and joy of His blessed comfort, even on this side of its heavenly fulfillment. Have you given up hope of finding comfort in your here and now? The promise of God’s comfort can be yours to claim as you grieve over sin and surrender your heart to holiness. You needn’t wait to feel relief. It’s as near as your next humble prayer. As the Father hath loved me, so have I loved you. We confess, do we not, that we have a Christian responsibility to believe God’s Word and to obey God’s Truth? Then we should accept the fact that it is our task to practice the Christian virtues in the power of the Holy Spirit as we await the coming of Him who will come. The great spiritual needs around us should drive us back to the Gospel records of the life and ministry of our Lord Jesus. When evil men crucified Jesus, killed Him, they had no power to change Him. They could not alter the Person or the personality of the Son of God. Putting Him on the cross did not drain away any of His divine affection for a lost race. The best thing we know about our Lord and Savior is that He loves the sinner. He has always loved the outcast—and for that we should be glad, for we too were once outcasts! We are descended from that first man and woman who failed God and disobeyed. They were cast out of the garden, and God set in place a flaming sword to keep them from returning! Dear Heavenly Father, that You love us at all is amazing. But to think that You came down to earth to redeem us is nearly inconceivable. Such love is worthy of all my praise and obedience. “This I pray . . .” (Phil. 1:9). Your prayers reveal the level of your spiritual maturity. As we come to our study of godliness in Philippians 1:9–11, we note that this passage is a prayer. Typically, Paul’s prayers reflected his concern that his readers mature spiritually. That is impossible without prayer, because spiritual growth depends on the Holy Spirit’s power, which is tapped through prayer. Prayer is so vital that Jesus instructed His disciples to pray “at all times” (Luke 18:1). Paul commands us to “pray without ceasing” (1 Thess. 5:17). Peter said we should be “of sound judgment and sober spirit for the purpose of prayer” (1 Peter 4:7). Scripture gives many other commands to pray, but the true test of your spirituality is your compulsion to pray, not simply your obedience to commands. As a Christian you exist in a spiritual realm in which prayer is as natural as breathing is in the natural realm. Just as atmospheric pressure exerts force on your lungs, compelling you to breathe, so your spiritual environment compels you to pray. Resisting either brings devastating results. The more you see life through God’s eyes, the more you are driven to pray. In that sense your prayers reveal the level of your spiritual maturity. Paul prayed with urgency day and night because he shared God’s love for His people and His concern for their spiritual maturity. Examine your own prayers. Do you pray from a sense of duty, or are you compelled to pray? Do you pray infrequently or briefly? Do your prayers center on your own needs or the needs of others? Do you pray for the spiritual maturity of others? Those important questions indicate the level of your spiritual maturity and give guidelines for making any needed changes in your pattern of prayer. Suggestions for Prayer: Thank God for the privilege and power of prayer. ✧ If you have neglected prayer, or if your prayers have been centered on yourself rather than others, confess your sin and ask God to give you a sense of holy urgency in praying as you should. ✧ Is there someone for whom you should be praying more consistently? For Further Study: Read Daniel 6:1–28. ✧ What was Daniel’s pattern of prayer? ✧ What accusation did the political leaders bring against Daniel? ✧ What was the king’s attitude toward Daniel? ✧ How did God honor Daniel’s faith? …Forgetting those things which are behind, and reaching forth unto those things which are before. The Christian is saved from his past sins. With these he simply has nothing more to do; they are among the things to be forgotten as the night is forgotten at the dawning of the day. The Christian is also saved from the wrath to come. With this also he has nothing to do. The wrath of God exists, but not for him. Sin and wrath have a cause and effect relationship, and because for the Christian sin is canceled, wrath is canceled also. To be engrossed still in what we have been saved from is to live in a state of negation. We are not called to fellowship with nonexistence. We are called to things that exist in truth, to positive things, and it is as we become occupied with these that health comes to the soul. Spiritual life cannot feed on negatives. The man who is constantly reciting the evils of his unconverted days is looking in the wrong direction. He is like a man trying to run a race while looking back over his shoulder! There is an art of forgetting, and every Christian should become skilled in it. Forgetting the things which are behind is a positive necessity if we are to become more than mere babes in Christ. And here’s the good part: into the empty world vacated by our sins and failures rushes the blessed Spirit of God, bringing with Him everything new. New life, new hope, new enjoyments, new interests, new purposeful toil, and best of all a new and satisfying object toward which to direct our soul’s enraptured gaze! MacArthur, J. (2001). Truth for today : a daily touch of God’s grace (p. 61). Nashville, Tenn.: J. Countryman. MacArthur, J. (2008). Daily readings from the life of Christ (p. 57). Chicago: Moody Publishers. MacArthur, J. F., Jr. (1993). Drawing Near—Daily Readings for a Deeper Faith (p. 61). Wheaton, IL: Crossway Books. This entry was posted in Daily Devotional Guide on February 18, 2017 by Truth2Freedom. I have a confession to make: I did not always love Second Corinthians like I do now. A lot of it is about Paul defending himself and his ministry, and he even speaks about boasting in this if he must. That seemed a bit odd to me, and I did not always fully understand and appreciate what he was getting at in this epistle. But for various reasons, in the past few decades 2 Corinthians has rocketed to my number one New Testament book. I am not sure if we are to so elevate one NT book over another, but its themes about strength in weakness and glory in suffering are so very vitally important today – certainly in the West. Many of our churches preach a triumphant gospel, one that often exalts power, one that exalts self, and one that exalts success. We find this especially in the health and wealth gospels, and in the name it and claim it theologies, both of which basically look down upon suffering and weakness. Thus 2 Corinthians is THE book of the hour for so much of Western Christianity. In it Paul takes on the “super apostles” and those who exalt all sorts of things (fame, power, signs and wonders, speaking ability, status, reputation, etc). Paul boasts instead of his weakness, his afflictions, his hardships and his suffering. These are the real marks of the true minister of the gospel he insists. And I could simply quote large slabs of the epistle to make this point. But let the reader check out these key passages: 2 Cor. 4:7-12; 6:3-10; 11:23-30; and 12:9-10. The motif that keeps emerging throughout this epistle is that weakness is the source of strength and that suffering is the vehicle for God’s power and glory…. The gospel does not ride on health and wealth but on weakness. The ministry of the Spirit is not one of splash and flash but of meekness and weakness…. Now if all this sounds very foreign to what is heard in most Western pulpits today, that is because it is so seldom preached. Hardly anyone is talking about suffering and hardship and weakness as indications of the genuine Christian life and work. Instead, we mainly hear about having your best life now, and getting everything you want to be happy and successful. Why do I suspect that if Paul tried to get a few speaking gigs in most churches today he would never make it through the door? He would be told his message is far too negative and would simply turn people off. After all, we need to be seeker sensitive and tell people what they want to hear. That is how we grow churches (and get even more moolah in the offering plate). The theology of suffering, of the crucified life, and of strength coming through weakness is about as alien as you can get in far too many churches today. Yet is was the very heart and soul of the message of the Apostle Paul, not just in 2 Corinthians, but in all his epistles. In that brief remark Lewis nails the very heart of the Christian life. It is clearly not a popular message today, but it is a thoroughly biblical one. And it is the message which the Apostle Paul saw as absolutely central to everything about his life and ministry. We should take the same view. The post 2 Corinthians and the Heart of Christian Life and Ministry appeared first on CultureWatch. This entry was posted in Biblical Lesson/Teaching, Christian Living on February 18, 2017 by Truth2Freedom. Leaving the NAR Church: Carter’s Story. This entry was posted in Reblogged Guest Post on February 18, 2017 by Truth2Freedom. You said you trust in Jesus yet you claim YOUR sin has disqualified you. Consider … this means you are not trusting in Christ alone but, at least partly, in your own ability to maintain a just standing before God. Still trusting in your own goodness to win Gods approval. But in Christ you already have his approval …The gospel is good news that Christ ALONE saves, not you. You will never defeat sin by trying, only Christ can do so in and through you. If you believe you don’t deserve heaven, by the grace of God flee from trusting in your own righteousness … all of it… you have nothing to offer God. You are spiritually bankrupt and can only come to him with empty hands as a poor sinner. Trust in Jesus alone. It seems that your sin deeply concerns you. This is a sign of life, for those without the Holy Spirit would be unconcerned, indifferent or hostile to God, rather than concerned or broken over their sin. In 1 Cor 11:31-32 it teaches than when a believer sins either we judge ourselves, or the Spirit will discipline us until we do so that we will not be condemned along with the world. That is good news .. the Spirit is working in you to be convicted over your sin, to hate it and, by the grace of God, to put it to death…. and you will be fighting it all you life .. in fact all of us are… when you fall though, the Spirit will ensure that you get back up and persevere to the end. Being a Christian does not mean you are sinless, but that you are united to the one who was, and God accepts you because of Him. Your cannot maintain your own standing before God … that is the Lord Jesus’ office, and His alone. This entry was posted in Christian Living on February 18, 2017 by Truth2Freedom. Pope Francis has offered his unequivocal support to grassroots organisers and activists who are fighting for social justice, migrants, and environmentalism, saying he “reaffirms” their choice to fight against tyranny amid a “gutting of democracies”. EDITOR’S NOTE: Yesterday, NTEB lifted the curtain on Organizing For Action, the George Soros funded leftist anarchy group that we will refer to from here on as the Obama Shadow Government. Now the Jesuit Pope Francis has decided to throw his hat into the ring, and without mentioning Obama or OFA by name, has come out 100% in favor of the burgeoning anti-Trump movement in Washington. “As Christians and all people of good will, it is for us to live and act at this moment. It is a grave responsibility, since certain present realities, unless effectively dealt with, are capable of setting off processes of dehumanisation which would then be hard to reverse,” the pontiff wrote in a letter that was read to organisers this week. The remarks can be viewed as a clear endorsement by the Argentinian pope of resistance against populist and xenophobic political movements. While he did not name Donald Trump, and stressed his remarks were not targeted at any individual politician, the letter, read at the opening of the US Regional World Meeting of Popular Movements in Modesto, California, seem to speak directly to protests against the Republican president. “The direction taken beyond this historic turning point – the ways in which this worsening crisis gets resolved – will depend on people’s involvement and participation and, largely, on yourselves, the popular movements,” Francis wrote. The letter was read aloud by a close ally of the pope, Cardinal Peter Turkson, who attended the meeting. In the letter, Francis condemned the growth of populist and xenophobic movements around the world, saying they posed a “grave danger for humanity”. He also criticised leaders who rely on “fear, insecurity, quarrels, and even people’s justified indignation, in order to shift the responsibility for all these ills on to a ‘non-neighbour’”. He offered praise to the activists who are organising in opposition to those threats. “I know that you have committed yourselves to fight for social justice, to defend our Sister Mother Earth and to stand alongside migrants. I want to reaffirm your choice,” he wrote. The remarks would not be the first time Pope Francis has appeared to take aim at the US president. The pope first criticised then-candidate Trump when he called for the building of a border wall between Mexico and the US, with Francis calling it an idea that was not Christian. This week’s remarks came as several prominent US Catholic cardinals, including Joseph Tobin of Newark, denounced Trump’s executive order banning travel from seven majority-Muslim countries, with Tobin calling the order “the opposite of what it means to be an American”. Charles Spurgeon once rightly said, “Discernment is not a matter of simply telling the difference between right and wrong; rather it is telling the difference between right and almost right.” Today, Pastor Randy White joins us to discuss discernment, fake news, and having the correct biblical perspective on our times and how to prepare for the challenging days our nation and church face. God has brought the nation of Israel back to center stage for the final years of this world before the Lord returns in judgment. Of all the policy decisions President Trump is faced with, none may be more important than how he works with and supports Israel. Joining us to discuss the critical relationship between the U.S. and Israel is Jan Markell of Olive Tree Views. There can be little doubt that the secular media in our nation on the whole is committed to the Socialist progressive movement, and the days of unbiased reporting of news is a thing of the past. Today we discuss the death of media objectivity; has the final nail been hammered in its coffin? This morning, Mike and Dave discuss a report on how “climate change” data has been manipulated to advance radical environmentalism, and take a look at the hypocrisy of Senate Democrats in the handling of President Trump’s cabinet nominations. We will also look at the increasing pressure progressives are putting on American businesses to get in line with their agenda. Plus, is media objectivity dead? Sadly, truth and facts are no longer priorities when political ideology reigns supreme. Certainly this generation faces enormous challenges as public education and media have succeeded at indoctrinating many of them into a secular humanist world view. And this generation of younger people will one day lead our nation and our churches; some already are! So how can we help them turn (back) to God instead of away from Him? Religion and Culture expert, Dr. Alex McFarland joins us today to discuss this and other concerns. Jesus warned His disciples in John 15 that because the world hated Him, it would also hate all those who believe in and follow Him as well. The times in which we live certainly bear out the truth of Jesus’ warning. But if we are not speaking God’s truth and living out the Bible, people may not know we are Christians. Led by atheists, LBGTQ activists, a corrupt humanist court system, and a corrupt media, our nation is seeing a steady diet of lawsuits against the free speech of Christian individuals and organizations. Religious freedoms are being redefined. This morning we cover some recent stories involving the godless push to eradicate biblical Christian morality in America, and we analyze some of the evidence of growing hatred and discrimination against Christians. Our special guest today is Brad Dacus, president of The Pacific Justice Institute. It’s vital for true believers to have a solid, biblical Christian worldview and do our best to see people and events with an eternal perspective. Though we were not given a spirit of fear, it’s easy to become anxious or overwhelmed if we focus on this world rather than the Word. This entry was posted in Biblical Lesson/Teaching, Christian Living, Culture, Media, Opinion/Commentary, Podcast on February 18, 2017 by Truth2Freedom.